These plastic plugs are designed to seal treatment or inspection holes drilled into poles for either inspection or treatment purposes. They have a broad thread which allows them to be easily inserted and removed. A number of colours are available. 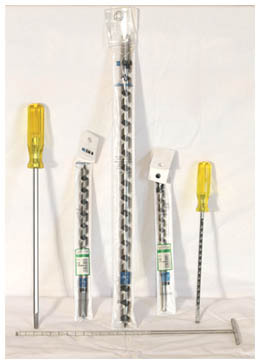 Sizes are to suit nominal 12mm (PP12), 16mm (PP16) and 19mm (PP19) treatment holes. 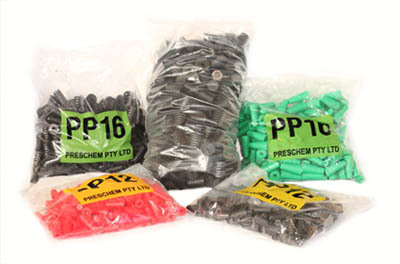 Plastic Plugs are sold in bags of 200. This simple tool fits into the square drive in the top of a plastic plug, allowing it to be inserted or removed. Sound Wood Gauges have calibrated markings used to measure the amount of sound wood remaining in a pole. The gauge is inserted into a hole drilled for internal inspection and the turned up end on the tool is hooked into the interface between sound and decayed wood and the markings used to determine remaining sound wood. These gauges are available in 90 and 45 degree calibrations. This fabricated metal box allows a Preschem Bioguard external treatment bandage to be stored and dispensed. Intended for use on a field vehicle the dispensing box allows the rolled bandage to turn and feed out a slot at the bottom. The bandage can simply be pulled out and cut to the desired length prior to installation.